This month, we are excited to announce our new partnership with music education startup, tonebase. 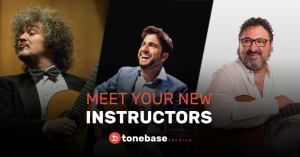 tonebase is an online instructional platform whose mission is to democratize access to top musicians and educators around the world. On the site you can find video lessons from high-level instructors including Grammy Award winners and esteemed professors at music schools including Juilliard, Peabody, Yale, and many more. Along with this, they also have an Interactive feature that allows you to receive private feedback on your playing from any one of these artists. Given both the Foundation and tonebase’s dedication to the promotion of music education on a global scale, our partnership seemed to be a natural fit. Together, we will be coordinating several exciting projects and rolling them out over the next year. Each project will combine the Foundation’s community connections and resources with tonebase’s technical expertise and large network of high-level musicians.